Anyone who has been keeping up with my Big Brother 2017 spoilers knows what was most likely going to happen at the Veto Ceremony today. Now I know for sure what happened at the Veto Ceremony on Big Brother 19 and if you want to know, all you have to do is keep reading! The feeds went down for the Veto Ceremony and when they came back up we found out if Jason used the Veto, who he used it on and then who was put up on the block in their place. The plan was for Jason to use it on himself and then Mark would be put up as the renom on Big Brother 19. Keep reading to find out if they stuck to that plan! The Veto was used on Jason and Christmas renom’d Mark as planned. After the feeds come back, Christmas goes to talk to him and tells him that it wasn’t personal. He thanks her for at least hearing him out and she tells him that if it had been one of three other people there never would have been a conversation. She tells him the bright side is that he can go hang out with Elena in jury and then jokes “unless you flip the house before eviction.” He tells her that he doubts that because he associated himself with Cody who rubbed people the wrong way. Looks like Mark is on his way out of the Big Brother 19 house this week and then they will have to start going after each other! I complain every year too Lilly about someone or something but that was part of it all, this is the first time ever that I’ve been disgusted enough to stopped watching. I came close last season but endured – enough is enough. 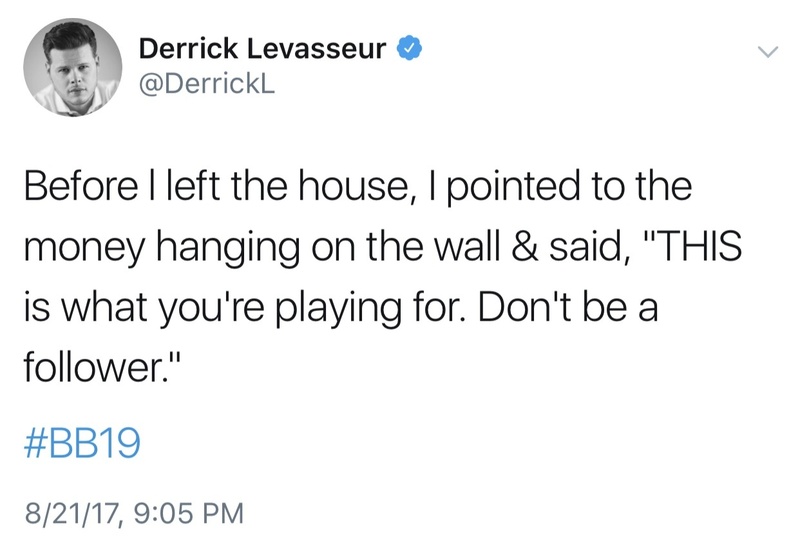 Good advice from a winner, not sure any of them will listen to him but good for him to try. This is great, thanks Tammie! I do NOT think any of them are smart enough to listen other than Paul who was probably working on them all to not pay any attention to him and those Froot Loop Dinguses would listen to him over Derrick. Awwww. I love you and everyone here. Not sure I should have thrown my blog-tantrum. But I just finally got tired of whining and complaining without doing anything about it. For the first time ever, I honestly believe nothing but a fluke win at F3 by someone who happens to evict Paul holds the tiniest hope to give us one second of unpredictability or excitement this entire season. In previous seasons we were frustrated by some bad luck, but even if our favorite didn’t win, we had UPS and downs. This season has been 95% down with almost NO ups. Not only frustration but predictability – past and future. I promise not to change my name to “Negative Nancy” going forward but I wanted to vent honestly. Good night, my friends! I’ll see you here tomorrow! Love you tons, Lilly and boy, do I relate to your disappointment in this season …. IMO, tho, Paul just took advantage of all of the rest of them being lazy, incompetent, stupid, immature, self-absorbed, fame crazy, idiotic followers … soooooooo, IMO they each ruined their own games and in effect, BB – I don’t blame Paul. What else was he to do when offered the lead? Production can only do so much, it’s just that these people let whatever happen around them because they have no confidence in playing this game. Yeah, Paul has been planting the seed of “I can’t win in the end” since day one to perhaps squelch that very possibility of being eliminated at F3. I would watch that, but Cody would probably be in a real fight with someone on that show … lots more pressure and very little down time – altho, maybe that would be where he and Jessica would excel? I would love to see Jody on TAR! And I think they would do quite well, since both of them are formidable competitors. The only thing I see that would keep Jody from winning TAR is if Cody gets in his male dominant stance and/or gets jealous if Jessica makes any kind of positive comment about another male player. I actually think the reason Cody was so anti-Paul was because Jessica complemented Paul’s game-playing; if not for that, I think they would have secretly joined up early and there would have been an F3 Jessica, Cody and Paul.